Lehenga choli is a traditional dress of India usually worn during functions or grand events like weddings. In states like Rajasthan and Gujarat it is also the daily attire for women. A long designed skirt is worn with a blouse known as the choli and a long dupatta is worn along with the lehenga choli. Whenever there is an occasion like Navratri or a wedding coming up, we hunt for new lehengas to appear special and traditional. But most of the times we do not know how to shop for the right lehenga. Bollywood style lehengas are very popular among the women and these are the ones we often wish to buy while watching the movies. Online shopping portals have opened celebrity fashion stores where you can easily select your favorite stars and choose the kind of saree, salwar or lehenga you have seen that celebrity wearing in a specific film or event. Just choose it and order. See how simply you can purchase something you have dreamt of possessing. While shopping for your dream lehenga you should keep a few factors in mind. Always be sure of the material of the lehenga that you are buying. If the material is of cheap quality even the best of designs won’t look impressive. Your body type will determine what kind of lehenga you must buy. Taller women can walk a different way and buy Indian Bollywood long anarkali sutis that appear exactly like lehengas. The exquisite silk anarkali in royal blue is floor length and almost has the appearance of a heavily worked lehenga. The detailed and intricate golden zari work makes this a piece of beauty. 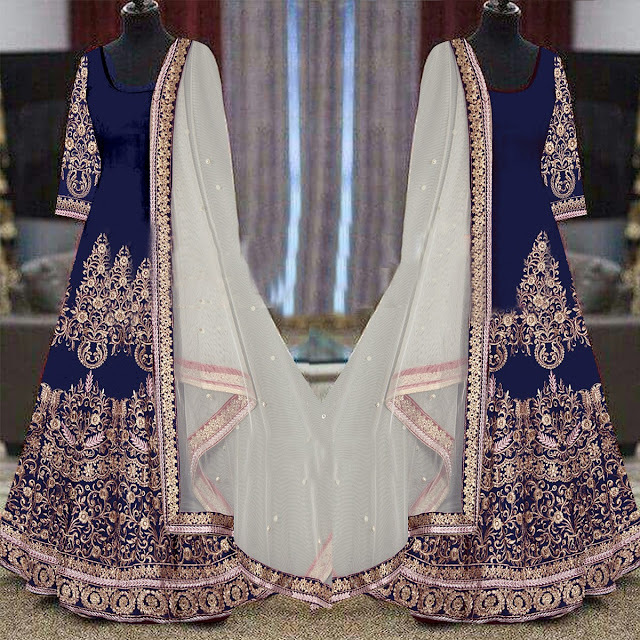 The adorned sleeves add to the beauty of the marvelous salwar suit. This would suit best upon a tall and slim figure. For a shorter frame it is best to go for circular or A-line lehengas. While shopping for lehengas you must keep in mind the occasion you are buying it for. The lehenga which you wish to wear for a navratri Dandiya festival will not be the same one that you can wear for your friend or sibling’s sangeet. We all have gone gaga over the Ram Leela lehengas and wished for such a lavish lehenga for the festive days. This georgette Ram Leela style lehenga is a traditional Gujarati lehenga with a designer touch. The black lehenga with an embroidered waistline and the pink and blue choli, heavily designed with golden zari machine work on the sleeves is a treat for the eyes. You should not even think of missing this out for a happening Garba night. 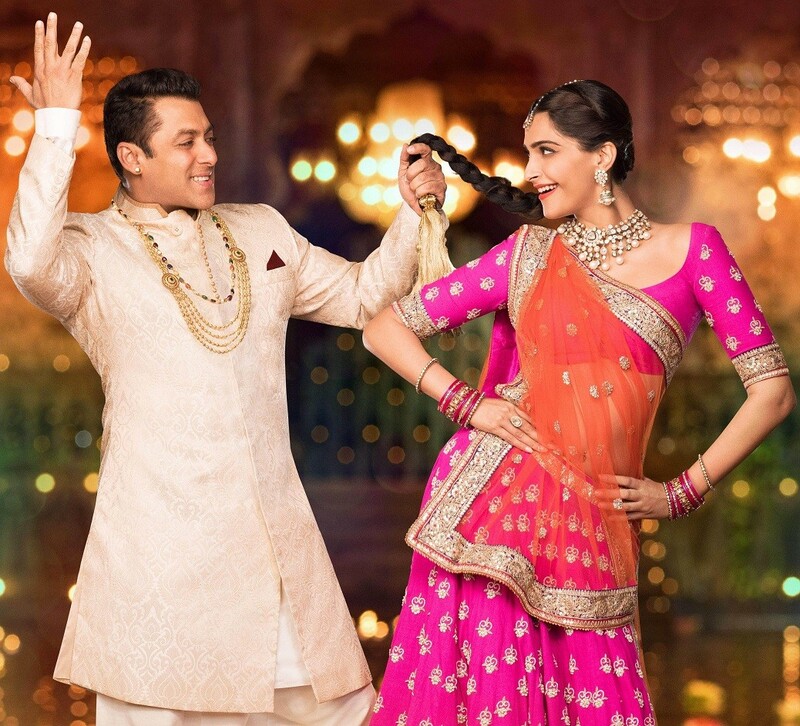 But for your brother or sister’s sangeet or for a wedding to attend you need something as gorgeous as Sonam Kapoor’s ‘Prem Ratan Dhan Payo’ style lehenga. The gorgeous pink georgette lehenga, replete with zari work motif embroidery and orange net lehenga makes you ready to look as outstanding as if you stepped out of a film’s set. Keep your requirements and figure in mind and get the best lehengas you dreamt of buying for yourself or shop for your dear ones. Let the page 3 fashion enter your closet through easy online shopping. Thanks For Sharing Knowledge With Us..
Deepika and Sonam both are looking gorgeous in these Lehengas. this post is very nice. but this designer anarkali suit is looking so beautiful.